Kristine Ramos is a Design Engineer for the Core Stage of the Space Launch System (SLS) Rocket with Boeing at Kennedy Space Center, Fl. She graduated from Florida State University with a Bachelors in Chemical Engineering and Materials Research from Carnegie Mellon and the FSU/FAMU College of Engineering. She has worked as a Materials and Process (M&P) Design Engineer for the Solid Rocket Boosters (SRBs) during the Shuttle Program and has worked as an Corrosion and Composite Engineer for the Aviation Engineering Directorate (AED) for the Black Hawk and Chinook Rotorcraft prior to working at Boeing’s Human Space Flight program. She currently provides engineering support for the International Space Station as well as the SLS Programs. When she is not playing rocket scientist, she enjoys kickboxing, Obstacle Course Races (OCRs) and school outreach programs to engage interest in future generations of human space flight. Kazi Tasneem is pursuing PhD study with Graduate Research Assistantship in the Department of Materials Science and Engineering at University of Central Florida (UCF). She recently won the Frank Hubbard Engineering Scholarship from UCF for 2016. She received Master of Science degree in Civil Engineering from UCF in 2014. She authored few scientific peer-reviewed journal articles and conference papers. She has been awarded Graduate Presentation Fellowships and Conference Registration & Travel Allocations from UCF to present her research internationally. She completed another Master of Science in Civil and Environmental Engineering with Graduate Research Assistantship from U.S. Department of Energy’s National Energy Technology Laboratory and Dean’s Fellowship at Carnegie Mellon University (CMU) in 2011. She has a Bachelor of Science degree in Chemical Engineering (2006) at Bangladesh University of Engineering and Technology, Bangladesh. She worked at University of Pittsburgh as a Part-time Lecturer in the Chemical Engineering Laboratory and worked as Research Staff in the Department of Chemistry at Duquesne University (2011-2012). She also worked as Research Engineer in a private company named Aquatech Engineers for three years in Bangladesh (2007-2010). Kazi Tasneem is a National Collegiate Member of Society of Women Engineers (SWE) for 5 years in Region G: Carnegie Mellon University and Region D: University of Central Florida. She has been selected to attend the Collegiate Leadership Institute at SWE Annual Conference in 2014. During her graduate study at UCF, she has been serving the position of Vice President of Bangladesh Student Association (BSA) at UCF since October 2015. Previously, she served the Treasurer position of BSA during 2014-2015. She has been selected to receive the Frank Hubbard Engineering Scholarship from UCF College of Engineering and Computer Science for extracurricular activities in 2016. In addition, Kazi Tasneem is affiliated as a Student Member with The Minerals, Metals & Materials Society, Biomedical Engineering Society, and American Society of Civil Engineers. Presently, she is assigned as a Member of the Advisory Panel for International Chemical Engineering and Science Magazine “ChE Thoughts”, which is the First International Chemical Engineering Magazine in Bangladesh. She also won the Young Researcher award to attend the 59th Meeting of Nobel Prize Winners in Chemistry, Germany in 2009. She has been accepted to participate in Young Scholar Einstein Berlin Program in “Falling Walls Conference” in Germany in 2010. She worked actively in the organizing committee of “Young Scientist Congress”, in Bangladesh in 2009, which was the first ever conference held in Bangladesh with active participation of young generation and there she delivered two invited lectures on Gender Participation in Development Science. During her engineering graduate life, she gets opportunity to meet people from different fields, and she believes she is gaining the capability to correlate different engineering ideas together. She considers this as her strength what will eventually help her in future to lead in profession and fulfill social commitments. Atoosa Vaziri, CFL V.P. of Membership Initiatives has recently joined Girl Scouts of Citrus Board of Directors. She is going to expand on the natural partnership that exists among the two groups in the coming year. Kelcia holds a Master of Science degree in Environmental Engineering, and Bachelor of Science degrees in Mathematics and Environmental Engineering. Kelcia is currently an active member of the Society of Women Engineers (SWE) and the American Water Works Association (AWWA), and other professional and social organizations. Recipient of 2015 Orlando Business Journal 40 Under 40 Award. The awards recognize Central Florida’s top professionals under the age for 40 who have made significant achievements in their career. Paula Stenzler is part of the Creative Division of Universal Orlando Resort and is responsible for the Engineering and Safety as part of the core engineering team. She manages a team of mechanical, electrical and controls engineers for ride systems development. 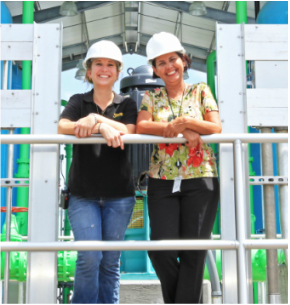 She joined Universal in 1994 as a Mechanical Engineer chartered to re-engineer mechanical ride systems for Universal’s sustainability effort. During her 20 year tenure with the company, Ms. Stenzler managed numerous re-design efforts at the Studios and Islands of Adventure. Ms. Stenzler is a graduate of the University of Central Florida and received her B.S. degree in Engineering; a M.S. in Management from New England College and is working on her Doctorate degree in Systems Engineering. She is a member of the Golden Key International Honor Society. She began her career as a tool designer of automated equipment for the Dayron Corporationy. After which, she worked for the FMC Corporation on the prototype design of a small de-icing vehicle. Finally, before accepting the position with Universal, she worked for the Transportation Group, on the design, manufacture, and installation of the passenger rail system for Capitol Hill. 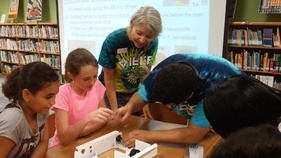 Ms. Stenzler has had a life-long career relationship with the Society of Women Engineers (SWE). She has held various national leadership roles with SWE leading initiatives to ensure private sector, public sector, government, academic institutions and small business are ready to grow, educate, train and retain the best and innovative diverse talent across all fields of engineering. Ms. Stenzler, is past chair for the Society of Women Engineers’ Government Relations and Public Policy Committee, Co-Chair of Give Kids the World Engineering Advisory Council, and Advisory Board Member for Valencia College’s Electrical and Electronics Engineering Program. 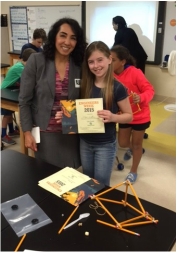 She has an infinity for STEM education and works tirelessly to bring students, academia, private industry, and the local community together to meet the growing needs of a STEM workforce in the Central Florida area. She currently serves as Valencia’s SWE Collegiate Interest Group (CIG) professional counselor. Tara Lamoureux is the City of Sanford Water Quality Specialist. She performed the City of Sanford Ozone/GAC Pilot study and assisted with treatment facility upgrades design and construction. Migdalia Hernandez is the City of Sanford Water Resources Engineer and project manager for water quality improvement projects. Since January of 2001, Deb Hall has had the honor of teaching at Valencia College within the Division of Engineering, Computer Programming, and Technology. Deb has been teaching courses which fall under both Valencia’s Electronics Engineering Technology Associate in Science, Pre-Major Engineering Associate in Arts Degree Programs, and the Bachelor of Science in Electrical and Computer Engineering Technology. Prior to Valencia College, Deb worked as an electrical engineer for about seven years within theme park ride and show control, electric vehicle battery testing, and solar power feasibility studies. She has earned both her Master of Science in Electrical Engineering and her Bachelor of Science in Electrical Engineering from the University of Central Florida and she has earned her Doctor of Education in Higher Education Leadership from Nova Southeastern University. Recent Achievement: Attempting to inspire young girls to pursue STEAM related careers by assembling "We Share Solar" suitcases that are portable renewable energy systems bound for remotely located orphanage schools in Uganda with Tildenville Elementary 4th and 5th graders and her own Valencia College Engineering and Technology Service Learning students. Central Florida SWE Vice-President Migdalia Hernandez accepted a position as the Public Works Director at the City of Orange City. She Started at Orange City on February 2, 2015. She is enjoying her new role as a Director and already getting involved with the community. See her photo from the Manatee Festival to the left. 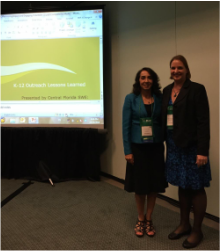 Cheri Maboudou-Tchao and Atoosa Vaziri recently spoke at K-12 Outreach Lessons Learned session at WE14 in Las Angeles October 23-25. View their presentation. Cheri Maboudou-Tchao is a marketing engineer at Siemens Energy, Inc in Orlando. Cheri began her career at Siemens in August, 2008 as a technical support engineer. Prior to joining Siemens, she spent ten years at Emerson Process Management- Rosemount Nuclear Instruments, Inc. in Minneapolis, MN where she held positions in quality, manufacturing, and analog design engineering. Cheri received her Bachelor degree in Electrical Engineering from North Dakota State University, where she first became involved with SWE. Within the Minnesota Section of SWE she held many positions. Cheri is a past President of the Central Florida Section. Atoosa Vaziri graduated from the University Of Central Florida (UCF) with a Bachelor's of Science in Computer Science and a Master's of Science in Management Information Systems. She works for General Dynamics C4 Systems in Orlando as an engineering Project Lead. She also teaches at DeVry University since 2005 as an Adjunct Professor. She has been Director of Membership for Central Florida section for the past 3 years. Her goal as the director of membership is to encourage women engineers to get involved with the SWE to help increase the number of women graduating with engineering degrees as well as enhance their own careers through taking advantage of the personal and professional development provided by SWE. She looks forward to continuing as the vice president of membership initiatives and enhance the positive experience of members. Elaine Schomburg-LaFleur, Project Manager Walt Disney World spoke on "Yesterday I was an Individual Contributor. Today I am a Manager" at WE14 in Las Angeles October 23-25. The dream you have been working towards, becoming a manager, has become a reality and the panic has set in. What skills are required to be a manager? Much of the transformative process is in learning to become comfortable adapting old skills and behaviors that served you well earlier in your career or life. The skills that got you to the role are not the skills that are going to make you successful in the role. This session will take you off the whirling dance floor and up to the balcony to prepare yourself for this new adventure in life. This will be recorded for the WE14 Virtual Conference. Congratulations to Tara Lamoureux on completing Master of Science in Environmental Engineering. Her Thesis was in “Disinfection By-Products Control and Treatment”, a Safe Drinking Water Act requirement. The City of Sanford innovative and cost effective approach to rehab old pipes and improve water quality project was presented at this year’s Florida American Water Works Association (AWWA) conference. This paper was selected by the Educational Committee as the “Best Professional Paper”. Rachel Hutter has been promoted to the role of vice president, Worldwide Safety for Walt Disney Parks & Resorts. In this role, Rachel will be responsible for the development and implementation of safety strategies for WDPR and will lead the Executive Safety Council and Worldwide Safety Committees, as well as serve as a member of the Asia worldwide operations steering committees. Rachel has been a member of SWE for 11 years. The City of Sanford Utility Department was selected for the FDEG Professional Development Award for their outstanding contribution to the advancement and improvement of the engineering profession. Accepting the award is Migdalia Hernandez, Water Resources Engineer and CFL SWE Vice President. Recommendation for this award came from Lesie Turner. Eileen Velez-Vega, P.E., received the Society of Women Engineers (SWE) Distinguished New Engineer of the Year Award during the SWE Annual Conference. She is managing partner of Kimley-Horn Puerto Rico LLC, a subsidiary company, and the first Kimley-Horn and Associates Inc. office in the Caribbean, which she helped establish in 2009. Eileen has been instrumental in creating the annual Lyman High School event for our CFL SWE chapter. She also recently completed her first Half Marathon with Team in Training supporting the Leukemia and Lymphoma society. Since joinging the Southwest Florida SWE Section, she served two terms as president, treasurer, and newsletter editor. She has generously contributed her time and talent to SWE on the regional level, holding the offices of Region D lieutenant governor and governon, and participated as student liaison on the SWE conference programming board. She frequently speaks at SWE regional and Society conferences. who served as last year’s Director of Outreach, had her baby boy on June 19 at 9:01am. He measured 19" and 7lb, 11 oz. Please join us in congratulating her & her family. who served as last year’s Director of Diversity, recently won the Kenneth J. Miller Founders’ Award for her outstanding service to the Water for People organization.